No more D-O-double-G. The rapper formerlyknown as Snoop Dogg joins the long line of musicians who have changed theirnames mid-career. His spiritual and artistic rebirth  he's a reggae artist now  came while he was in Jamaica, where the new name was bestowed upon him by Rastafarian priests. "I want to bury Snoop Dogg, and become Snoop Lion," he told journalists at a news conference in New York. "I didn't know that until I went to the temple, where the High Priest asked me what my name was, and I said, 'SnoopDogg.' And he looked me in my eyes and said, 'No more. You are the light; you are the lion.' From that moment on, it's like I had started to understand why I was there." 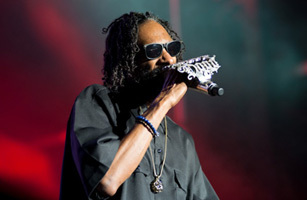 Snoop has been a mainstay on the rap seen since 1992 when he was discovered by Dr. Dre. Twenty years later, perhaps he knew it was time for a reinvention. "I've won every accolade you can get in rap, they call me 'Uncle Snoop' in rap," he said. "When you're an uncle, it's time to find something new ... I want to feel like a kid again."